Why does it always feel like we are off to the executioners bloc in some nightmare like the Game of Thrones when we haul out? I think it’s because dry land is not a place a ship should experience. However, hauling out is a necessity. Unusually, this is the second time in the last 12 months. Why? 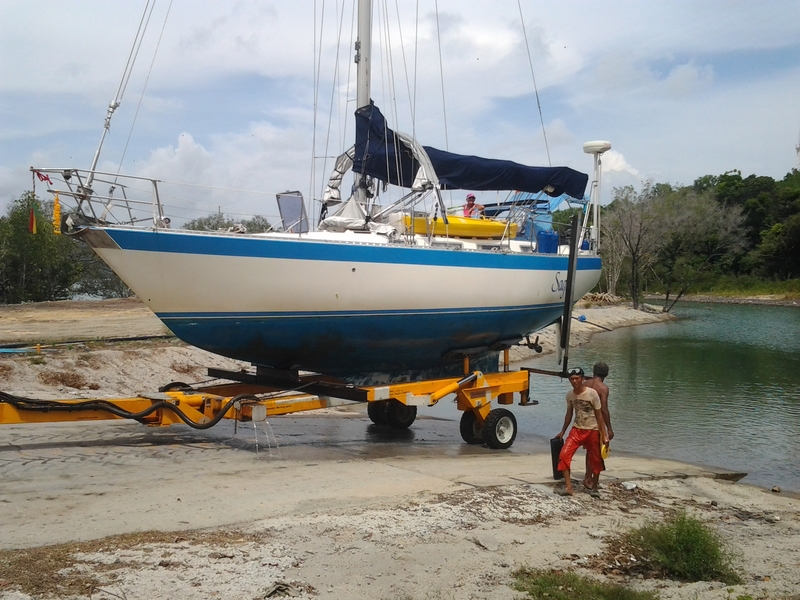 Well, last July we had to haul out to fix a broken centreboard and now we are hauling out to put the boat into storage while we travel back to Canada for a break from the onslaught of the wet season. The first question in this region is ‘where can one haul out at a reasonable rate yet be close to needed supplies and trained labour?”. Luckily two years ago Premier Boatyard opened up at the north end of the island of Phuket. 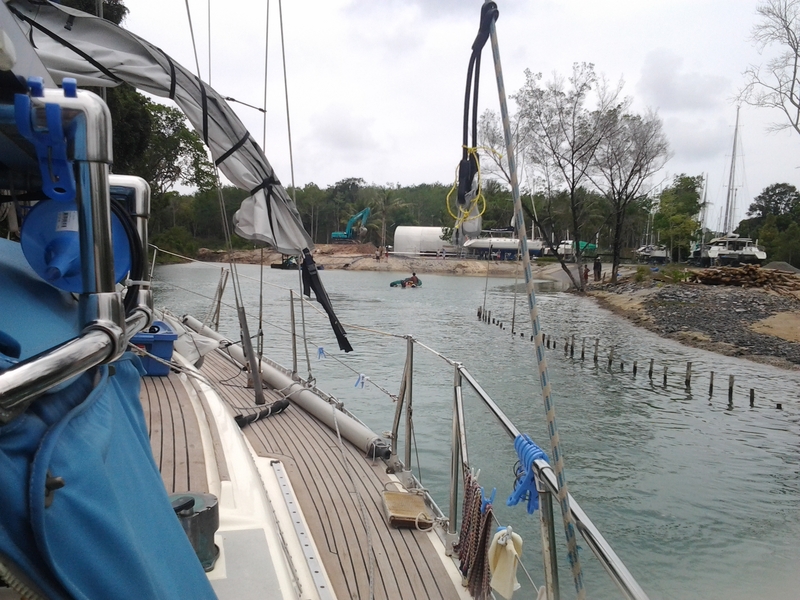 It is a little tricky getting into Premier Boatyard as it requires going under the main powerlines feeding Phuket and making your way throught the mangroves to the haul out ramp. From the above photo you can see the masts of boats that have already hauled out. Luckily for us we have a centreboard and we only draw 1.4 metres which is even less than some of the catamarans. Easy you say. Well, we are still very nervous. It is shallow on the way in and we follow the lead dinghy that guides us but the catamaran that went in first already went aground and the ebb current is threatening to push us sideways onto the sand bank and the stakes poking up from the water’s edge. .
And then we are through. A deep hole in the mangroves greets us and we are held in place with bow and stern lines on both sides to hold us in place for the lift. Part one is complete and now it’s time to haul the boat. This time it’s different. We are usually hauled out by travelift but this time we are going to be loaded on a trailer and hauled out by a tractor. In the photo above you can see people in the water positioning the boat for the trailer. 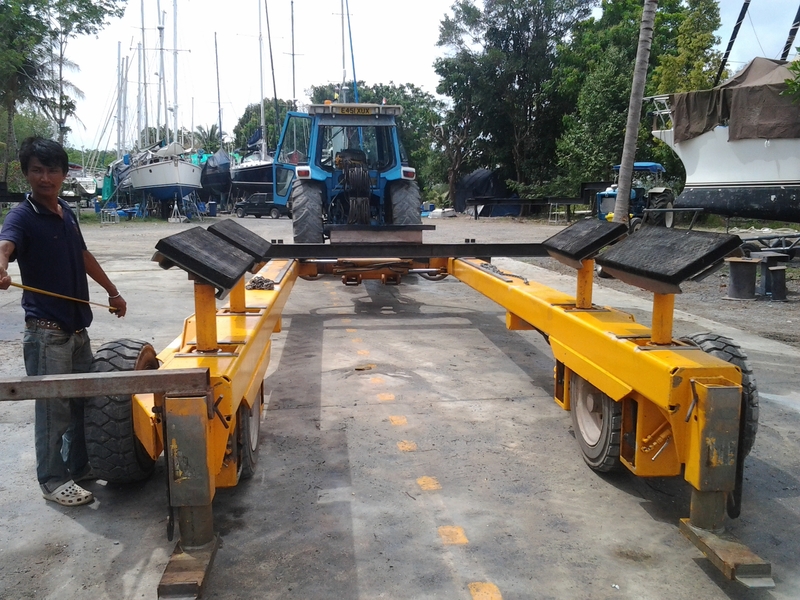 The trailer has hydraulic arms to support the boat while the tractor hauls the boat out of the water. 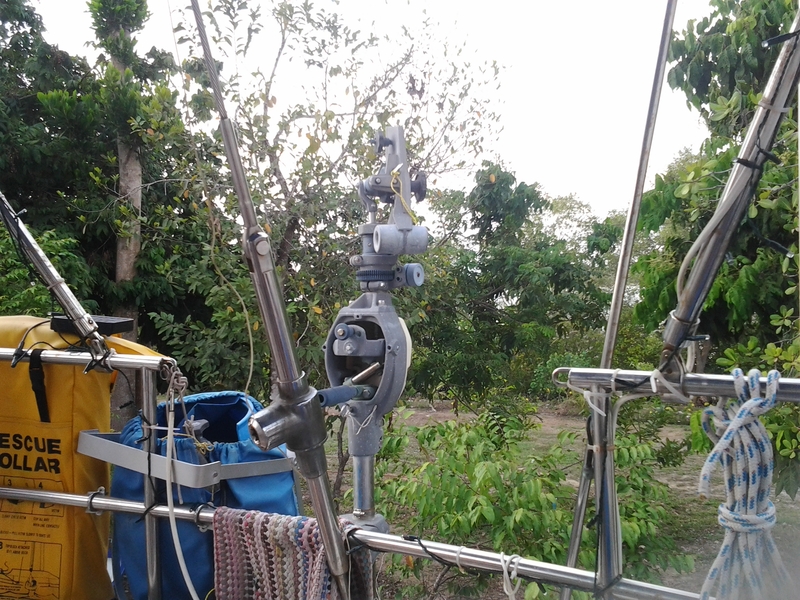 It’s an ingenious design being simple, effective and efficient. However, we are always nervous taking the boat out. Just imagine if your house was being moved and was put on the water while the new foundation was being built. I think you, too, would have a few concerns. Well, we are out. Connie is still up in the cockpit for a free ride while I am trying out the camera function on the tablet since my main camera has died. We are making our way up the ramp ready for the power washing and then the move to Sage’s home for the next six months. Yes, we are leaving the boat for that long and we are sad. It is just not the environment to leave her in but it is less worrisome than leaving her in the water. So this is the view now from the back deck. We are kept awake at night by the chirping birds in the trees behind us. We can see the boats travelling up and down the channel between Phuket and the mainland in the distance and we can admire the flower boxes in the gardens off the stern. Weird for sailors who are used to watching the fish jump around the boat with clear unobstructed views of the horizon. We have to clamber over the stern and down the 6 metre ladder to head to the washrooms but best of all it is only a few metres away to the BBQ! Hi Tony, you’ve certainly picked the right time to come home. Weather has been mild and spring has sprung! I’ve enjoyed the blog of your travels since you left Victoria. It would be great to see you when you get back up here. Lunch is on me! I really liked Premiere when I did my rece of Phuket. It’s a nice spot. Good to hear you made it in ok. Now you realise why most of the boats there are cats! Enjoy the last of it before Canada. I relate entirely to hauling out stress! Also to leaving your home unattended for months. Prepping right now for 5 months up in Alaska. Lovely clear photos thanks for the update. Enjoy your trip home. Wishing you a safe trip back to Canada. We will be back in August for 3 months. Hope to see you then. Barrie and Sandra. What a slick trailer! I’m assuming the dude with the goggles was under the boat to check positioning before the trailer came all the way up. Obviously no WCB down that way! Give me a call when you’re home. It’d be good to hook up while we can still recognize each other.